Best of the Week: Panasonic 4k OLED TV, Q Acoustic's 3050i, potential Netflix price change and more | What Hi-Fi? A round-up of the week's highlights, including Panasonic's new 4K OLED and Q Acoustics' 3050i speakers. This week, we learned Netflix could be introducing a new price tier to its streaming service, Krell has produced its most affordable integrated amplifier yet and Klipsch is bringing more speakers over from the US, including floorstanders and a centre speaker. 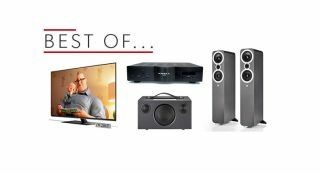 We have a number of reviews for you to browse, inlcuding Audio Pro's Addon C3 wireless speaker, Panasonic's TX-55FZ802 OLED TV and Q Acoustics' 3050i floorstanding speakers. It's also new What Hi-Fi? week, with the August issue now on sale. Inside you'll find coverage on loudspeakers from entry-level to £2000 whoppers. There's plenty of news on the latest goings on in the world of hi-fi and home cinema and reviews as well as our usual bevy of reviews. August 2018 issue on sale now! Netflix is said to be testing its price structure with the possible introduction of a new Ultra tier. The Ultra tier could be the only way to access UHD and HDR content on the service. It's also been mooted that Premium users could see simultaneous screen usage drop to two, while Ultra sits atop with four. This is still in its testing phase and it's not been rolled out to UK or US customers yet. One to watch with interest. Klipch's Reference speakers are making the way over to the UK after their stateside launch earlier this year. There's the RF-7 III floorstander and a matching centre channel in the RC-64 III. The former features a new 4.5cm titanium compression tweeter and a 25cm Ceramatallic woofer. The centre contains four 16.5cm woofers. The RF-7 III comes in three finishes and costs £3750 per pair. The centre is priced at £1450. The K-300i is Krell's most affordable integrated amplifier. But don't mistake it for being cheap. With a 150 watts per channel at ohms doubling to 300 watts into 4 ohms, the K-300i weighs 18.2kg and has two balance XLR inputs, three pairs of stereo RCA inputs and two pairs of speaker and stereo RCA pre-amp outputs. The starting price? £4698. If you want some digital options too, that will set you back £5698. New Qualcomm chipset to facilitate budget true wireless earbuds? Amazon to launch free TV channels on Prime Video? Amazon Echo vs Dot vs Plus vs Show: which is best? Sonos Beam vs Playbar vs Playbase: which is best? "The Panasonic FZ802 is a superb television - and a real return to form for Panasonic"
We haven't been too taken with Panasonic's recent TVs. This OLED serves as a reminder of how good the Japanese company can be. The 55FZ802 OLED improves on last year's effort, showcasing perfect blacks with bright whites and vibrant colours. The operating system is basic and it's not as strong in sharpness and definition stakes as its main rivals. Nevertheless, this is a LG OLED-esque performance for less money. "Q Acoustics has squeezed more performance into its mid-level towers than ever before"
We very much enjoyed Q Acoustics' 3050 speaker and the 3050i proves to be even better. They offer a punchy, musical and subtle sound, with a large scale presentation and lots of energy. They look slick and aren't fussy when it comes to positioning. Q Acoustics has done it yet again. "Another superb addition to Audio Pro’s arsenal of multi-room speakers"
Audio Pro's C3 is the multi-room version of its T3 speaker that delivers the kind of performance we expect from the brand. It's a sound that's open and detailed, with tight textured bass and impressive timing. The control app has its issues, but its portability, multi-room features and sound make for an excellent wireless speaker.